The American Joint Committee on Cancer (AJCC) 8th edition marks a paradigm shift in the staging of head-and-neck cancers. It introduces several novel considerations into the staging of head-and-neck cancer, with distinct therapeutic ramifications, to stage and prognosticate patients better. In oral cancer, it introduces the depth of invasion as a determinant of T-stage. The nodal staging recommendations have also upstaged extranodal extension, which has been shown to be a high-risk adverse feature associated with worse survival. In oropharyngeal cancer, human papillomavirus (HPV) expression of tumors has been used to reclassify tumors into two separate entities, with distinct staging systems. For HPV-positive tumors, nodal staging has been divided into clinical staging and pathological staging, for better prognostication of HPV-positive diseases treated with surgery. In carcinoma of unknown primaries with cervical nodal metastasis, immunohistochemical staining of nodal tissue for HPV and Epstein–Barr virus has been recommended in all cases. These recommendations are based on a high-quality evidence aimed at personalizing cancer therapy to optimize outcomes while minimizing morbidity. The new recommendations address many of the shortcomings of the previous editions. The practice of oncology in India, however, is markedly different from that in the Western world. Majority of these recommendations are universal; however, some are likely to have hurdles in implementation in India. The American Joint Committee on Cancer (AJCC), 8th edition marks a paradigm shift in the staging of head-and-neck cancers. It introduces several novel considerations into the staging of head-and-neck cancer, with distinct therapeutic ramifications, to stage and prognosticate patients better. These changes are shown in [Table 1]. In oral cancer, it introduces the depth of invasion as a determinant of T-stage. This standardizes the staging of oral cancer tumors and acknowledges the importance of depth of invasion in nodal spread and overall survival. It also eliminates “extrinsic muscle invasion” from stage T4 for oral tongue cancer; this was a constant source of confusion since the depth of invasion required to involve the extrinsic muscles of the tongue was highly variable depending on the position of the tumor in relation to the tongue. Even very superficial tumors could invade the extrinsic muscles of the tongue. The nodal staging recommendations have also upstaged extranodal extension, which has been shown to be a high-risk adverse feature associated with worse survival. In oropharyngeal cancer, human papillomavirus (HPV) expression of tumors has been used to reclassify tumors into two separate entities, with distinct staging systems. For HPV-positive tumors, the T-stage no longer has T4b, or very advanced local disease, which represents the improved prognosis that these patients have when compared to their non-HPV counterparts. For HPV-positive tumors, nodal staging has been divided into clinical staging and pathological staging for better prognostication of HPV-positive diseases treated with surgery. In carcinoma of unknown primaries with cervical nodal metastasis, immunohistochemical staining of nodal tissue for HPV and Epstein–Barr virus (EBV) has been recommended in all cases. This recognizes the high incidence of metastasis from an HPV-positive oropharyngeal or an EBV-positive nasopharyngeal primary tumor, and the need to standardize the diagnostic evaluation in these patients, to avoid inadequate evaluation and inappropriate treatment. These recommendations are based on a high-quality evidence aimed at personalizing cancer therapy to optimize outcomes while minimizing morbidity. The practice of oncology in India, however, is markedly different from that in the Western world. India spends a small fraction (under 2%) of its gross domestic product on health-care services, with an estimated 65% of all health care-related expenditure being spent out-of-pocket. This results in a clear majority of patients with cancer receiving an insufficient quality and standard of care. This context of resource constraints has a significant impact on the practice of resource-heavy medical specialties such as oncology, where newer diagnostic and therapeutic techniques are often out of reach for many patients in developing countries. The new recommendations made by the 8th edition of the AJCC for head-and-neck cancer are to be implemented from January 1, 2018. The purpose of this article is to determine the feasibility and practicality of these recommendations in an Indian context and identify potential hurdles in their implementation. Tumors having a depth of invasion 5 mm or less are classified as T1, those having a depth of invasion 6–10 mm are classified as T2, and those with a depth of invasion more than 10 mm are classified as T3. The recommendations describe the determination of depth of invasion by both clinical and pathological assessments. During clinical examination, the need to recognize the difference between a thick, exophytic but less invasive oral cavity tumor from an ulcerated deeply invasive one is stressed. This may be possible in subsites such as tongue and buccal mucosa but seems difficult in other subsites such as hard palate and floor of mouth and gingiva. The subjectivity and interobserver variability in determining the clinical depth of invasion may be challenging. For those treated with surgery, the measurement of depth of invasion is pathological, where a plumb line is dropped from the adjacent mucosa to the deepest point of tumor invasion. 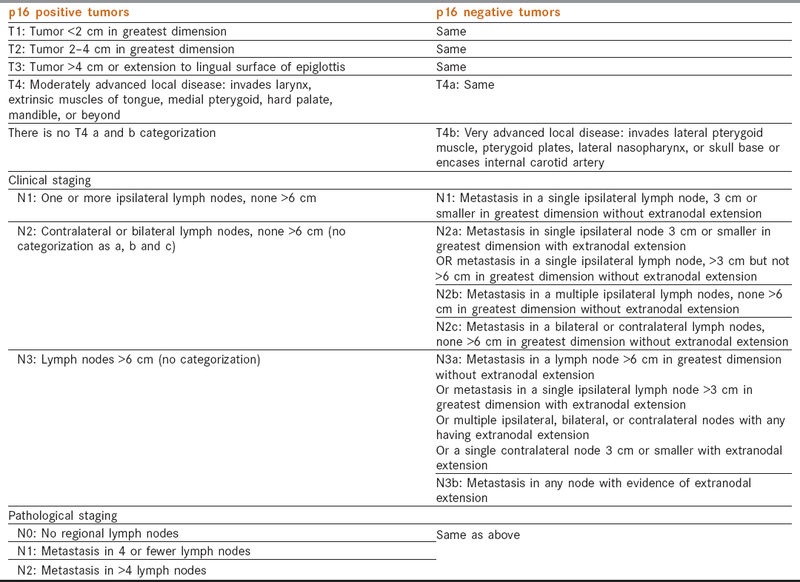 The issue with this parameter, as seen in other malignancies, is the interobserver variability; studies have shown a variable concordance rate among pathologists with respect to depth of invasion., One of the tools used to standardize reporting has been the use of digital pathology systems,, but they are unavailable in a vast majority of centers in India. A significant number of patients with oral cancer in India are treated with radiotherapy, either as brachytherapy or external beam radiotherapy.,,, Measurement of depth of invasion in these patients poses a bigger challenge; there is no consensus on radiological determination of depth of invasion in oral cancer. Even within a particular subset, like tongue, there have been several recommendations on radiological depth measurement: Preda et al. and Lwin et al. have suggested that it be done in axial sections of the tongue, from the surface of the tumor to the deepest point of invasion, using the contralateral normal side as a reference, while Park et al. and Lam et al. described estimation in coronal sections using a plumb line and the perpendicular distance to either end of the tumor. There is even more ambiguity between different subsites of the oral cavity. Tumors having a depth of invasion less than or equal to 5 mm are classified as T1, those having a depth of invasion 6–10 mm are classified as T2, and those with a depth of invasion more than 10 mm are classified as T3. This would imply that tumors with a diameter of ≤4 cm in surface dimensions, but a depth of invasion over 10 mm that would previously be staged as T2 will be migrating to T3 and hence Stage III in the overall staging. Whether this stage migration demands a combined modality treatment including surgery and adjuvant radiotherapy is not clear. Though the general convention is to treat a Stage III tumor with combined modality, the evidence that thicker tumors will benefit from adjuvant treatment does not exist. The evidence base for the changes including the thickness is based on the survival outcomes.,, It is not clear from those studies that the better survival was achieved by the addition of the adjuvant treatment. Tumors that required, single modality treatment would now require multimodal treatment in view of the change in T-stage, making a pretreatment determination of depth of invasion crucial. The AJCC has acknowledged the distinction between oropharyngeal cancers caused by HPV and those that are not, by introducing different staging systems for both [Table 2]. For HPV-positive oropharyngeal cancers, they have introduced different clinical and pathological nodal staging systems: the clinical system is dependent on the nodal size and laterality, while the pathological system is dependent on the number of involved nodes. This reflects the high incidence of HPV-related oropharyngeal cancer in the United States, which has been shown to be consistently over 70%. Data on the incidence of HPV-related oropharyngeal cancer from the Indian subcontinent are scanty, but is suspected to be significantly lower, with the largest study showing an incidence of around 20%. Staging is to be applied using p16 overexpression as determined by standardized criteria as quoted by the AJCC:,, more than or equal to 75% tumor expression with at least moderate (+2/3) intensity of staining. It is to be noted, however, that this classification is relevant from a prognostic point of view, not a therapeutic one; although there are several ongoing de-escalation trials, their results are yet to be published, and the treatment of oropharyngeal cancer remains the same irrespective of p16 status. Incorporation of p16 into staging of all oropharyngeal cancers is a difficult proposition in the Indian context: many centers do not have trained workforce to perform the staining for or interpret immunohistochemistry. For HPV-positive oropharyngeal cancer, clinical nodal staging is now similar to the nodal staging for nasopharyngeal cancer: N1 is one or more ipsilateral nodes with none >6 cm, N2 is contralateral or bilateral lymph nodes with none >6 cm, and N3 comprises nodal disease >6 cm. Pathological staging is N1 when metastasis occurs to ≤4 lymph nodes and N2 is metastasis occurs to >4 lymph nodes. This is meant to better prognosticate HPV-related oropharyngeal cancers at two distinct points – with clinical determination of staging at presentation and definitive pathological staging following surgery. This is most likely a reflection of the increasing use of transoral robotic surgery (TORS) in the treatment of oropharyngeal cancer in the United States,, due to its wide availability, functional outcomes, and the cost-effectiveness in their setting. Access to TORS, however, has been shown to correlate with socioeconomic status even in a developed country; the number of patients with head-and-neck cancer in India with access to TORS is minuscule. Whether this dual staging is widely applicable in a country with a largely heterogeneously treated group of patients is debatable; it is likely that a large proportion of patients with HPV-related oropharyngeal cancer in India are still treated with radiotherapy or chemoradiotherapy, and will not have a pathological nodal staging for prognostication unlike those treated with surgical resection. It remains unclear how best to stage patients treated with different modalities to compare survival outcomes, which is an important consideration in future studies. For patients with squamous cell carcinoma demonstrated in cervical lymph nodes without any demonstrable primary site of malignancy, strong recommendations have been made regarding the addition of immunohistochemistry to the diagnostic evaluation. Acknowledging that around 90% of all unknown primaries are associated with an HPV-related oropharyngeal cancer in the United States,, the AJCC has recommended that HPV in situ hybridization, p16 immunohistochemistry, and EBV-encoded RNA in situ hybridization be performed for all unknown primaries of the cervical lymph nodes. Whether this recommendation is feasible in an Indian context is debatable; the number of unknown primaries associated with HPV in India is likely to significantly fewer when compared to that of the West. The technical expertise and equipment required to perform routine immunohistochemistry and techniques such as in situ hybridization are also lacking in many centers that provide cancer care in India. The new recommendations made in the AJCC 8th edition reflect a significant acknowledgment of recent evidence to provide a more accurate and sensitive system for staging and prognostication of head-and-neck cancers. A critical review reveals that these recommendations are likely based on treatment practices and trends in the United States. While many of these recommendations are broad and universally applicable, some are difficult to administer and implement in an Indian context, especially in a resource-constrained setting. For oral cavity tumors, a consensus regarding radiological depth of invasion measurements is necessary for oral cavity lesions being treated with primary radiotherapy to minimize stage migrations and inappropriate treatment. In view of the literature that Stage III/IV oral cavity tumors have improved survival with primary surgery when compared to primary chemoradiotherapy,,, thicker tumors having a radiological depth of invasion >10 mm may be better served with surgery for pathological staging. Standardization of pathology is imperative for all subsequent classification and study; digitalization may aid in this wherever available. Dual nodal staging in HPV-related oropharyngeal cancer is a potential source of confusion. The guidelines have not made any mention of how a comparison between patients treated with different modalities should be made, although logic would dictate that clinical nodal staging be used as a baseline for comparison, while pathological staging be used only as an additional prognostic tool in those treated with surgery. Routine use of immunohistochemistry and other molecular techniques in unknown primaries is unlikely to be implemented widely in India, for financial and logistic reasons. Whether it is required based on the incidence of HPV-related cancers in the Indian subcontinent, or better used as a selective tool in patients at risk (e.g., younger patients with no history of tobacco use), remains to be seen. The new recommendations made by the AJCC 8th edition for the treatment of head-and-neck cancers address many of the shortcomings of the previous editions. Majority of these recommendations are universal; however, some are likely to have hurdles in implementation in India. They represent a step toward standardization in radiological and pathological reporting; however, the degree of compliance that can be attained to these recommendations remains to be seen. Mahul BA, Edge SB, Greene FL. AJCC Cancer Staging Manual. 8th ed. ZG, switzerland: Springer; 2017. Available from: https://www.cancerstaging.org/references-tools/deskreferences/Pages/default.aspx. [Last accessed on 2017 Oct 24]. Murthy SP, Thankappan K, Jayasankaran SC, Milind K, Prasad C, Balasubramanian D, et al. “Deep extrinsic muscle involvement” is a fallacy in the American joint committee on cancer's seventh edition of tumor staging of oral cavity cancers. J Oral Maxillofac Surg 2017. pii: S0278-2391(17)30619-5. Hay S. Evolution and Patterns of Global Health Financing 1995–2014: Development Assistance for Health, and Government, Prepaid Private, and Out-of-Pocket Health Spending in 184 Countries; 1995–2014. Pramesh CS, Badwe RA, Borthakur BB, Chandra M, Raj EH, Kannan T, et al. Delivery of affordable and equitable cancer care in India. Lancet Oncol 2014;15:e223-33. Almangush A, Bello IO, Keski-Säntti H, Mäkinen LK, Kauppila JH, Pukkila M, et al. Depth of invasion, tumor budding, and worst pattern of invasion: Prognostic indicators in early- stage oral tongue cancer. Head Neck 2014;36:811-8. Corona R, Mele A, Amini M, De Rosa G, Coppola G, Piccardi P, et al. Interobserver variability on the histopathologic diagnosis of cutaneous melanoma and other pigmented skin lesions. J Clin Oncol 1996;14:1218-23.
International Consortium for Outcome Research (ICOR) in Head and Neck Cancer, Ebrahimi A, Gil Z, Amit M, Yen TC, Liao CT, et al. Primary tumor staging for oral cancer and a proposed modification incorporating depth of invasion: An international multicenter retrospective study. 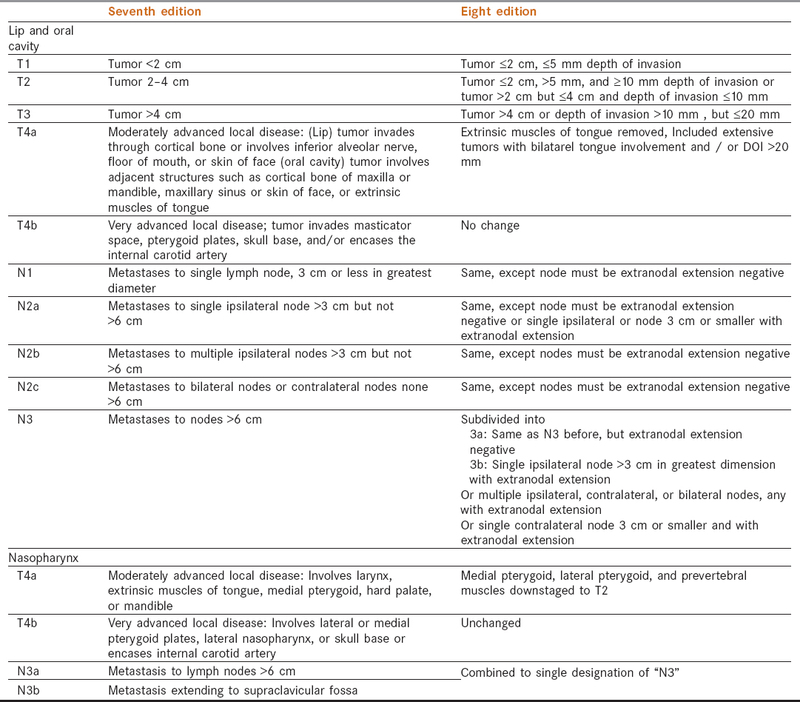 JAMA Otolaryngol Head Neck Surg 2014;140:1138-48. Komuta K, Batts K, Jessurun J, Snover D, Garcia-Aguilar J, Rothenberger D, et al. Interobserver variability in the pathological assessment of malignant colorectal polyps. Br J Surg 2004;91:1479-84. Rocha R, Vassallo J, Soares F, Miller K, Gobbi H. Digital slides: Present status of a tool for consultation, teaching, and quality control in pathology. Pathol Res Pract 2009;205:735-41. Yeole BB, Sankaranarayanan R, Sunny L, Swaminathan R, Parkin DM. Survival from head and neck cancer in Mumbai (Bombay), India. Cancer 2000;89:437-44. Murthy NS, Chaudhry K, Rath GK. Burden of cancer and projections for 2016, Indian scenario: Gaps in the availability of radiotherapy treatment facilities. Asian Pac J Cancer Prev 2008;9:671-7. Murthy V, Agarwal JP, Laskar SG, Gupta T, Budrukkar A, Pai P, et al. Analysis of prognostic factors in 1180 patients with oral cavity primary cancer treated with definitive or adjuvant radiotherapy. J Cancer Res Ther 2010;6:282. Nair MK, Sankaranarayanan R, Krishnan E, Padmanabhan TK, Mayadevi S, Mathew A. Independent predictors of response and disease-free survival in oral cancer treated with radical radiation therapy. Cancer 1992;69:2221-6. Preda L, Chiesa F, Calabrese L, Latronico A, Bruschini R, Leon ME, et al. Relationship between histologic thickness of tongue carcinoma and thickness estimated from preoperative MRI. Eur Radiol 2006;16:2242-8. Lwin CT, Hanlon R, Lowe D, Brown JS, Woolgar JA, Triantafyllou A, et al. Accuracy of MRI in prediction of tumour thickness and nodal stage in oral squamous cell carcinoma. Oral Oncol 2012;48:149-54. Park JO, Jung SL, Joo YH, Jung CK, Cho KJ, Kim MS, et al. Diagnostic accuracy of magnetic resonance imaging (MRI) in the assessment of tumor invasion depth in oral/oropharyngeal cancer. Oral Oncol 2011;47:381-6. Lam P, Au-Yeung KM, Cheng PW, Wei WI, Yuen AP, Trendell-Smith N, et al. Correlating MRI and histologic tumor thickness in the assessment of oral tongue cancer. AJR Am J Roentgenol 2004;182:803-8. Vogel DW, Zbaeren P, Thoeny HC. Cancer of the oral cavity and oropharynx. Cancer Imaging 2010;10:62. Chaturvedi AK, Engels EA, Pfeiffer RM, Hernandez BY, Xiao W, Kim E, et al. Human papillomavirus and rising oropharyngeal cancer incidence in the United States. J Clin Oncol 2011;29:4294-301. Bahl A, Kumar P, Dar L, Mohanti BK, Sharma A, Thakar A, et al. Prevalence and trends of human papillomavirus in oropharyngeal cancer in a predominantly North Indian population. Head Neck 2014;36:505-10. Jordan RC, Lingen MW, Perez-Ordonez B, He X, Pickard R, Koluder M, et al. Validation of methods for oropharyngeal cancer HPV status determination in US cooperative group trials. Am J Surg Pathol 2012;36:945-54. Schlecht NF, Brandwein-Gensler M, Nuovo GJ, Li M, Dunne A, Kawachi N, et al. A comparison of clinically utilized human papillomavirus detection methods in head and neck cancer. Mod Pathol 2011;24:1295-305. El-Naggar AK, Westra WH. P16 expression as a surrogate marker for HPV-related oropharyngeal carcinoma: A guide for interpretative relevance and consistency. Head Neck 2012;34:459-61. Motz K, Chang HY, Quon H, Richmon J, Eisele DW, Gourin CG, et al. Association of transoral robotic surgery with short-term and long-term outcomes and costs of care in oropharyngeal cancer surgery. JAMA Otolaryngol Head Neck Surg 2017;143:580-8. Dias FL, Walder F, Leonhardt FD. The role of transoral robotic surgery in the management of oropharyngeal cancer. Curr Opinion Oncol 2017;29:166-71. Tatebe LC, Gray R, Tatebe K, Garcia F, Putty B. Socioeconomic factors and parity of access to robotic surgery in a county health system. J Robot Surg 2017. [Epub ahead of print]. Keller LM, Galloway TJ, Holdbrook T, Ruth K, Yang D, Dubyk C, et al. P16 status, pathologic and clinical characteristics, biomolecular signature, and long-term outcomes in head and neck squamous cell carcinomas of unknown primary. Head Neck 2014;36:1677-84. Motz K, Qualliotine JR, Rettig E, Richmon JD, Eisele DW, Fakhry C. Changes in unknown primary squamous cell carcinoma of the head and neck at initial presentation in the era of human papillomavirus. JAMA Otolaryngol Head Neck Surg 2016;142:223-8. Spiotto MT, Jefferson G, Wenig B, Markiewicz M, Weichselbaum RR, Koshy M, et al. Differences in survival with surgery and postoperative radiotherapy compared with definitive chemoradiotherapy for oral cavity cancer: A National cancer database analysis. JAMA Otolaryngol Head Neck Surg 2017;143:691-9. Iyer NG, Tan DS, Tan VK, Wang W, Hwang J, Tan NC, et al. Randomized trial comparing surgery and adjuvant radiotherapy versus concurrent chemoradiotherapy in patients with advanced, nonmetastatic squamous cell carcinoma of the head and neck: 10-year update and subset analysis. Cancer 2015;121:1599-607. Gore SM, Crombie AK, Batstone MD, Clark JR. Concurrent chemoradiotherapy compared with surgery and adjuvant radiotherapy for oral cavity squamous cell carcinoma. Head Neck 2015;37:518-23.